ACS: What Causes Brain Freeze? Know Before It's Too Late! What Causes Brain Freeze? Know Before It's Too Late! Since our childhood most of us have wondered about the bitter sweet torture known as "Brain Freeze." 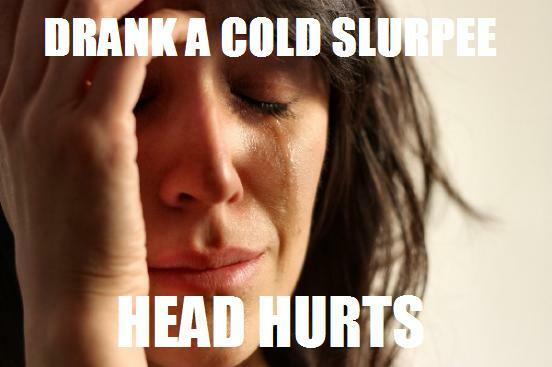 Brain freeze happens when you are eating a delicious ice cream or Slurpee or chugging a refreshing cold drink. Your fear of cold beverage thieves causes you to drink them extra fast which then causes an excruciating pain in the sides of your head. Until now those guys in white coats that figure out ways to improve our quality of life also known as scientists have had no answer to the questions we asked about brain freeze. What causes it? Why does it happen? They have found that the pain caused during a brain freeze situation is actually a rapid increase in blood pressure to the brain. Our brains must stay at a certain temperature in order to function like civilized human beings, when we drink something cold the temperature in certain parts of our brains go down, in order to fix itself one of the brains main arteries the anterior cerebral artery begins to move warm blood to the cold area. They were able to prove this by hooking up 13 participants to brain monitoring equipment then inducing brain freeze by having the subjects rapidly sip very cold water. The studies where over seen by The Department of Veteran Affairs New Jersey Healthcare System, National University of Ireland Galway, and Jorge Serrador of Harvard Medical School. They are an effort to understand more about headaches and brain trauma patients like combat injured soldiers.